CinefamilyAccountability (CA) has reported on Cinefamily’s planned 2018 reopening as Fairfax Cinema. Initial reactions from distributors and Cinefamily donors and patrons indicate Dan Harkham and the Cinefamily/Fairfax team have challenges ahead in rebuilding trust with the film community. Many distributors and donors are owed money by Cinefamily. Many in the L.A. film community were horrified to find themselves associated with an abusive environment and have called for change and oversight. CA is working with former staffers to collect daily attendance numbers across several years. We hope to provide, as a resource for distributors, a searchable guide to raw Cinefamily attendance as reported internally, and which can be cross-checked against official Rentrak reporting. Rebuilding trust with Cinefamily donors and supporters may be more difficult. 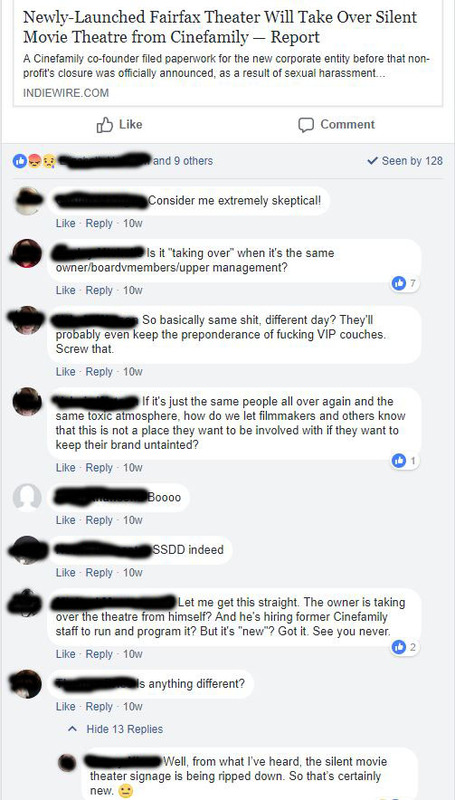 In a Facebook group dedicated to “the mission of the Cinefamily,” former staff, volunteers, and back card members have been harshly dismissive of Fairfax.